Ben Sargent shares his love of the open waters with adventure stories and simple seafood recipes that will entice you with their fresh flavors. An avid fisherman, home cook, and veteran surfer, Ben has been mesmerized by fishing since childhood. He catches almost everything he eats, but even if you don't, "The Catch "is the perfect book for cooking simple, delicious fish and shellfish. These 100 recipes will teach you how to stuff, grill, sautE, fry, roast, smoke, bake, and fillet to perfection, from classic preparations for salmon, shrimp, and clams to chowders using snakehead and blackfish. Showcasing Ben's signature lobster rolls (for which people journey many oceans), "The Catch" also features recipes such as Catfish Sandwich with Dill REmoulade & Sliced JalapeNos (a recipe Ben made from his first catch); Mahi Ceviche with Grapefruit, Toasted Coconut & Roasted Peanuts (inspired by the flavors of Central America); Striped Bass Chowder with Broccoli Rabe Pesto (which makes enough to share with friends); Oyster Pan Roast with Garlic Butter Toasts (the perfect dish for two); and Flounder in Grape Leaves (grilled whole over an open fire). 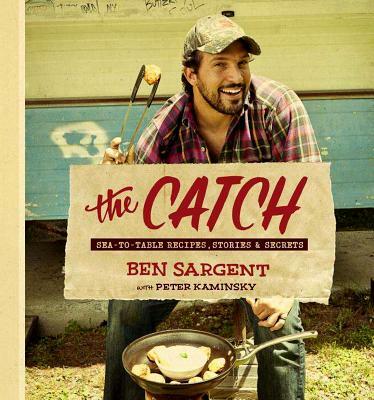 With stunning photos from the bountiful waters of Brooklyn to the Caribbean coast, "The Catch "is Ben's take on sustainable seafood and will become your go-to resource when you want to savor fish and seafood in your home kitchen. BEN SARGENT is the host of "Hook, Line & Dinner "on Cooking Channel. He is the creator of the cult alter-ego personality Doctor Klaw and is the founder of the Brooklyn Fishing Derby. He lives in Brooklyn. PETER KAMINSKY is a well-known angling and cooking author. He is the former Outdoors columnist for the "New York Times" and has written cookbooks with chefs such as Daniel Boulud, Michel Richard, and Sheila Lukins. His most recent books are "Bacon Nation "and "Culinary Intelligence."